Posted on November 27, 2017 at 10:21 pm. Groundwork has been getting our hands dirty! 10,000 trees have been planted to date as part of an effort to improve environmental conditions in former industrial cities across the state of Massachusetts. “Gateways cities” such as Lynn, Lawrence and Brockton often suffer from significant economic and environmental challenges such as the urban heat island effect, polluted storm water run off and declining property values and tax base. This tree-planting program is designed to increase the density of urban tree canopies and use the trees’ natural capacity to clean the air and water and improve the community’s appearance. Groundwork has played a critical roll in getting trees in the ground by working in the neighborhoods, knocking on doors and partnering with local neighborhood and non-profit groups. 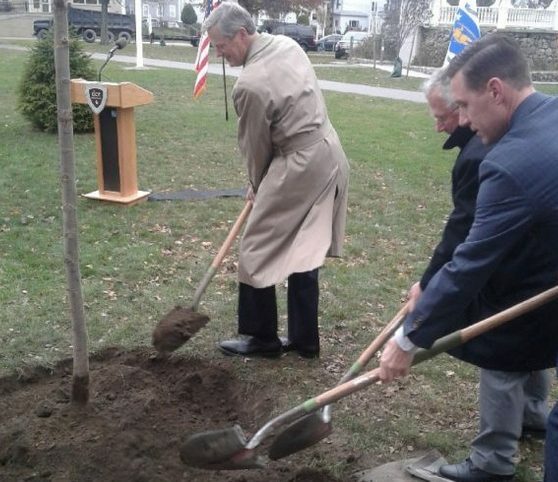 Support from Governor Baker, State Senator McGee, and State Rep Cahill (pictured here, planting one of the 10,000 trees), has been essential to the success of this program. We are excited to continue the effort.